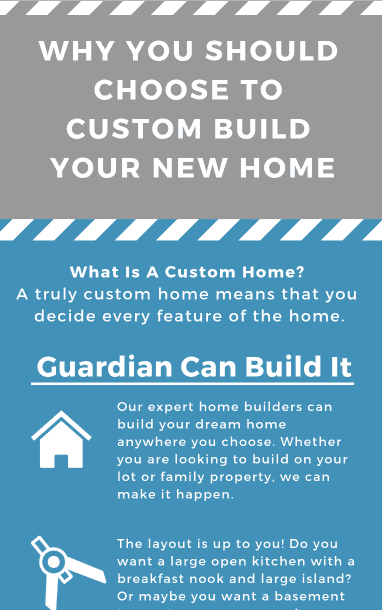 Guardian Homes is known for building beautiful custom homes for any budget in Idaho and Utah. A truly custom home means that you decide every feature of the home. From interior and exterior colors and finishes to floor-plan layout and additional built-ins, we can build exactly what you want. We believe that building a custom home is the best option for new homeowners. The first benefit is that we can build anywhere you choose. Whether you are looking to build on your lot, or in one of our recent developments, we can make it happen. Another benefit is that we can design a unique layout just for you. Do you want a large open kitchen, a basement, or detached garage? We draft unique home layouts, perfect for your family and needs. The third benefit of custom building your home is that we can build within your budget. When you build custom, you get to construct your home exactly the way you want and can afford. Lastly, we can build a home you are proud of. When you custom build, experience pride of ownership.